Warren Buffett is a huge advocate of companies that can boast a sustainable competitive advantage. His annual letters to shareholders are peppered with references to investments that generate high levels of sustainable returns because of their brand power, cost advantages and scale. Apply these rules to the FTSE 100 and you find names like British American Tobacco, Reckitt Benckiser and Burberry. Blue chips like these are likely to continue driving mighty returns from the likes of cigarettes, household products and fashion. 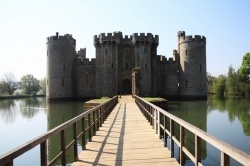 While truly sustainable moats generally aren’t found in smaller companies, there is no reason not to set the benchmark high in the search for quality. Indeed, looking for signs of a moat could be a useful first step in finding where long-term profitable returns really lie in a market like AIM. The hallmarks of an economic moat are varied - Ed wrote a detailed article about it here - but in screening terms there are signals that offer clues to finding one. These stocks typically command high operating margins and generate high levels of free cash flow (which can be invested). Those investments themselves produce strong returns, which can be seen in measures like return on capital employed (ROCE) and return on assets (ROA). A useful additional check is Stockopedia’s QualityRank. This takes into account these long-term quality factors but also includes balance sheet strength and any potential accounting or insolvency risk red flags. These are useful in spotting the signs that a moat may be narrowing or drying up altogether. Using these rules, we screened AIM for companies that are showing the signs of an sustainable competitive edge. Stockopedia subscribers can see the full screen results here. Interesting when I looked at personal group from this list it said "personal group does not appear on our stock screens"? This is the problem with Stockopedia ratings, it ignores problems that are current with the companies. The reason why Cenkos look cheap is they are being investigated for their involvement with QPP. I think QPP quite high in ratings as well and look what happened to them. Another one that has plummeted is PUR down 50%. THT also rated highly, so has fallen over 40%. o my advise don't solely rely on the ratings. Herbie. There's a couple of clarifications I should make here. Firstly stocks of every single rank can rise and fall - that should be expected. The key point is that higher ranked stocks historically have outperformed lower ranked stocks on average. Past performance is no guarantee of future returns but if the market continues to behave as it has done for the last 100 years then they should continue to outperform on average. You can read up on how to use the StockRanks in this detailed article. Diversification is key - I have repeatedly written that the key to benefiting from the StockRanks is broad diversification - 25 stocks. That helps ensure that winners outnumber losers in any set of stocks. Another key is minimising cherry picking stocks one likes from high StockRank lists. Joel Greenblatt has repeatedly stated that people who used his Magic Formula as a stock picking list tended to massively underperform his top ranking portfolio - mainly because they cherry picked the wrong stocks from the lists. Often much of the outperformance comes from names many wouldn't pick. e.g. how many have held Crawshaw, Sprue Aegis, Staffline, Walker Greenbank, Renew Holdings or JD Sports (some of the stocks that have multibagged having been ranked 90+) ? I am not suggesting that anyone blindly follow the StockRanks - but am merely trying to help people understand some of the pitfalls that have befallen stock pickers that use ranking systems. It's very easy to justify loading up on a stock whose story you like when you find it has a high StockRank - but that would be missing the point - it would probably be accentuating a behavioural bias rather than minimising it. PS - QPP was never ranked higher than 51 - e.g. see this old report from it's highs. Thanks Edward for your long reply. Sorry I was mistaken about QPP rating. Of those companies you list I have or have had 3 of them, Renew Im looking to sell due to Paul Scott's views re risk. One other minor point is that the reason these strategies have continued to perform over time is precisely because they are psychologically hard to follow. This can be due to the presence of either stocks with the 'uughh' factor as Ed pointed out from the Greenblatt study. However it can also be because they don't perform for long periods of time... 5+ years. In this time most people have lost faith with the strategy. I remember reading about a fund that had a really good long term track record of 15-20% but whose dollar-weighted return for the average investor was something like 3%. Essentially investors bought when the fund had done well for a period and sold when they'd done badly so bought high and sold low. The QVM strategy mitigates this to some extent since the factors have historically some level of negative correlation but if it hasn't been performing recently maybe that means it's the time to be going long those strategies? That said I would always filter out companies that I think are frauds or insolvent even if I was aiming for a pure quant strategy...see 'Quantative Value' by Gray & Carlisle for a strategy that removes companies with significant risk of earnings manipulation or bankruptcy. Joel Greenblatt's record over the last 3 years is quite poor going by his Magic Formula screen, only up about 15%. Slater Zulu and Naked Trader are up about 100%. I like the principles of the magic formula, buying quality companies at attractive valuations. Although my view is that his execution is too simplistic and others have struggled to replicate his findings. Given that the principles are fairly sound that level of underperformance against the market and the other strategies is probably very bullish for the magic formula and bearish for Zulu and naked trader going forward - might need to start taking more notice of the magic formula rank in the future. The Magic Formula screen seems to pick up loads of frauds. For a while, the screen was doing better than my Fantasy Fund. But since April, the stock market has been unkind to companies of poor quality, and the Greenblatt screen has taken a caning. It is a subject that I have blogged about quite a lot. There is some evidence that suggests that a pure EV/EBIT screen outperforms an EV/EBIT and ROC combo OVER THE LONG TERM. ROC has a tendency to mean-revert. This makes the whole matter rather complicated. I agree that Greenblatt's strategy is v. simplistic - and likely due to its simplicity (and popularity) it has attracted plenty of admirers in recent years which may have killed the alpha. Third parties have struggled to replicate its supposed 30% annualised returns - certainly we built our model to replicate his ideas as authentically as we possibly could and it's consistently underperformed. I think it's worth noting though that the Nifty Thrifty strategy championed by Richard Beddard of iii has done exceptionally well. It's simply the Magic Formula + the F-Score - adding a bit of complexity has worked wonders here - it's up 80% over 3 years. Regarding QVM - I don't think it's been underperforming - the top decile has outperformed the lower deciles if not the market cap weighted All Share - but the markets generally all year have been flat and smaller caps have underperformed. John Authers has been writing a lot about how active fund managers have had a dismal year - 90% haven't beaten the market - but that's a bit of a sleight of hand as most active managers have been overweight small caps (which have underperformed). I am in the camp that believes the best active managers simply expose themselves consistently to the persistent anomalies like Size, Value & Momentum. If Size, Value and Momentum haven't done well, then stock pickers generally can't do well. Patience has always paid off. A year of churn after a multi year bull market is a very healthy thing. Just listened to 'Quantitive Value' author Tobias Carlisle talking about deep value on authors @google - he mentions the magic formula strategy underperforming a simple EBIT/EV and that from a quant perspective quality measured by a simple metric like ROCE reduces risk adjusted returns due to its mean reversion tendency. The returns that greenblatt quotes for the strategy are highly size dependent and don't survive the transistion to an investable universe. The research of AQR finds a positive return to quality that is independent to value just that by using a simple metric like ROCE only risks reducing your returns not enhancing them. Whist I agree with some points on here, I also disagree with a lot of points. Any screening strategy has to be back tested. Different strategies work at different periods. I have looked into Beddards screener before and when I spoke to him about his screens, his analysis in my view was one sighted. He never took other ideas onboard. It may be the first time I have seen his screener actually produce results (albeit small). The last time I saw the results, it was shocking (well it still is in my opinion). 45% since June 2010. That is shocking in my view. Just look at the losses in certain positions! 73% loss in one and still holding! What is all that about? To much faffing about for little profit. Jo Bloggs is better off picking a couple of well run funds by decent managers and made a lot more! Sorry Ed I do not agree with Beddards Screener. I know and you know that Financial Journalists do not make good stock pickers. I also disagree that you need 25 stocks. This is old fashioned methodology. You state how many people have held WGB, RNH, STAF etc. Well yes I have actually and spotted fairly early. Also on the screeners why do you just track performance to a maximum of 2 yrs? This is rubbish in my opinion. Also rubbish is the fact that you just track the performance in relation to the FTSE 100. Beddards criteria is specifically targeted at the ftse 350. Hence it should be compared to the FTSE 350. Likewise with any screener on there it should be compared to the said Index's that they are screening. If multiple than there should be multiple displayed. Just comparing it to the FTSE100 is like having a chocolate teapot.